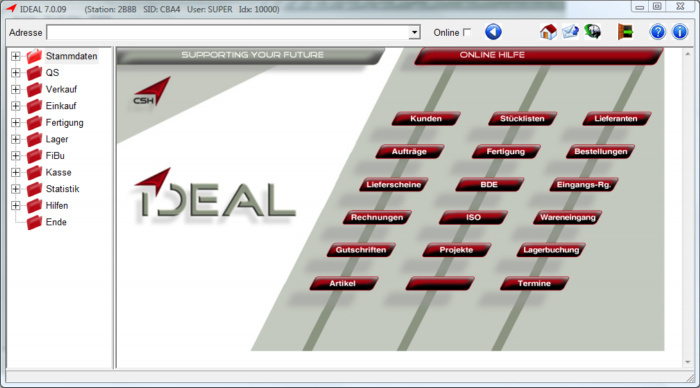 IDEAL is an enterprise resource planning system with PPS elements that was developed for small to medium-sized enterprises in trade and production. It features next to extensive functionality in particular by a high degree of flexibility and individual customization. Through the consistent use of the integrated scripting enging CARA Customized requirements can be easily implemented. A number of program parameters already allow a configuration with no further adjustments to the program functions to the realities of your operation. IDEAL is modular and consists of a basic version with extensive functionality and various modules that can be purchased separately depending on operational requirements. Residue management, residue lists, open purchase orders, payments, etc. Index cards / information sheets, many statistics, etc.